3aAB7 – Construction Noise Impact on Wild Birds – Pasquale Bottalico, PhD. Almost all bird species use acoustic signals to communicate or recognize biological signals – to mate, to detect the sounds of predators and/or prey, to perform mate selection, to defend their territory, and to perform social activities. Noise generated from human activities (in particular by infrastructure and construction sites) has a strong impact on the physiology and behaviour of birds. In this work, a quantitative method for evaluating the impact of noise on wild birds is proposed. The method combines the results of previous studies that considered the effect of noise on birds and involved noise mapping evaluations. A forecast noise simulation was used to generate maps of (1) masking-annoyance areas and (2) potential density variation. Figure 1 Mapping of the interaction areas of noise effect on birds within the 7 zones for a project without (a) and with mitigations (b). Waterman et al. and Reijnem et al. [3-4-5] proposed a trend of the potential variation in birds density in relationship with the noise levels present in the area. This trend shows no effect on density when the noise levels are lower than 45 dB(A), while there is a rapid decrease (with a quadratic shape) for higher levels. 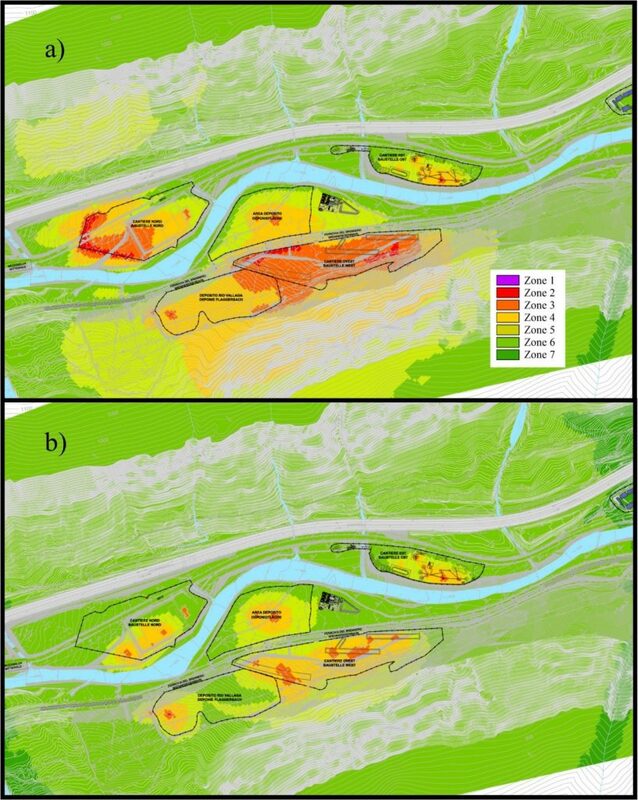 An example of the potential decrease in bird density for a project with and without mitigations is shown in Figure 2. The blue areas are the areas where the birds’ density is not influenced by the noise, while the red ones are the areas from where the birds are leaving because the noise levels are too high. This methodology permits a localization of the areas with greater impacts on birds. The mitigation interventions should be focused on these areas in order to balance bird habitat conservation and human use of land. Figure 2 Potential decrease in bird density for a project without (a) and with mitigations (b). R. J. Dooling and A. N. Popper, The effects of highway noise on birds, Report prepared for The California Department of Transportation Division of Environmental Analysis, (2007). E. Waterman, I. Tulp, R. Reijnen, K. Krijgsveld and C. ter Braak, “Noise disturbance of meadow birds by railway noise”, Inter-Noise2004, (2004). R. Reijnen and R. Foppen, “The effects of car traffic on breeding bird populations in woodland. IV. Influence of population size on the reduction of density close to the highway”, J. Appl. Ecol. 32(3), 481-491, (1995). R. Reijnen, R. Foppen, C. ter Braak and J. Thissen, “The effects of car traffic on breeding bird populations in Woodland. III. 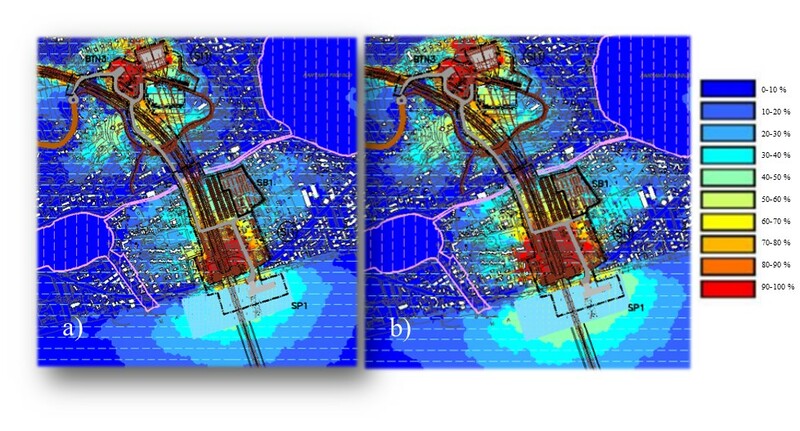 Reduction of density in relation to the proximity of main roads”, J. Appl. Ecol. 32(1), 187-202, (1995). R. Reijnen, G. Veenbaas and R. Foppen, Predicting the Effects of Motorway Traffic on Breeding Bird Populations. Ministry of Transport and Public Works, Delft, Netherlands, (1995).